Optimism, Child-like Enthusiasm, a Positive Mind, Cheerfulness, Creativity, Resilience, and an Amazing Patience - all Personified. That’s Chitra Amma for you! I have never seen her down for a long time and she will never loose her temper no matter what! (I have literally seen her flare up just once or twice – so you can imagine what kind of aggravation can make that happen – and God save the aggravator!) I feel I live a very good life, because I like to think that there is maybe just a very tiny microgram of her qualities in me (okay..okay … I do loose my temper very often..and patience?? Whats that?)! I found this recipe in Vah Chef’s videos. Check the video here. Here are the quantities I used, and some of my learnings. I surprised myself, as it turned out absolutely delicious, aromatic and melts in your mouth – just like good halwas should! 1. Boil Almonds for a few minutes until the skins are wrinkled. Immerse them in cold water. Remove the skins and discard. 2. Grind Almonds and milk together into a paste. You can stop just short of making a very fine paste – smooth as say idli batter. 3. Take a heavy bottomed vessel and heat ½ cup ghee on a low flame. 4. When the ghee has melted, add the badam and milk mixture. Stir well and begin cooking. Keep the flame in low through-out the preparation. As the mixture cooks, it will thicken. 5. Now add the sugar and one cup of ghee and stir and continue cooking. 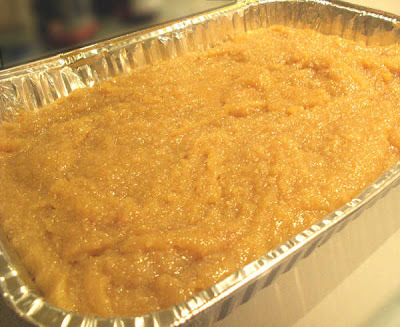 Be very careful not to burn the bottom, as even a slight browning can spoil the taste of badam halwa. 6. You will soon see small eruptions on the surface. This is what I call ‘volcanos and dimples stage’ and its real fun to see it happen!! Be very careful as this is really hot, and can burn your skin. Keep stirring to prevent burning! 7. 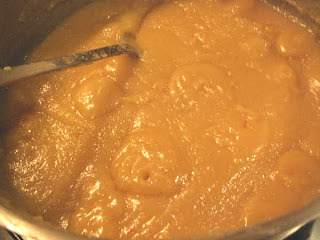 The ‘volcanoes and dimples’ will subside, and the ghee will start separating from the halwa as the mixture cooks. 8. 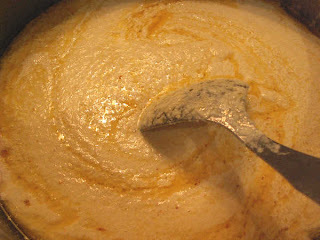 Now add the saffron, cardamom powder and the remaining ghee and continue stirring. 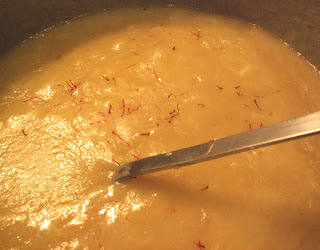 The saffron will provide a lovely colour to the badam halwa. I don’t like adding colour to my cooking – else a drop of yellow food colour can make this ‘hotel style’! 9. Pour the halwa into a flat decorative tray (I just used a foil tray) – and make sure you take the first serving for yourself, and enjoy the ‘halwa’ of your labour! a) Although this was the first time I tried this, it turned out absolutely delicious ! b) Badam quantity can be deceptive! Initially, I took only ½ the pack, and felt it would be too less. However, with the full pack (1 kilo), I landed up with a huge volume of halwa as you can see in the snaps! If you land up making too much – pack some off to your near and dear ones, and they will be super thrilled! I have therefore, halved the quantities in the recipe here! c) Don’t be conservative with ghee. This is a rich dish, and if you do not add sufficient ghee, it will not taste good. Further, less ghee increases risk of the halwa sticking at the bottom of the vessel and burning. Ghee also allows the halwa to stay for a long time. My halwa has stayed at room temperature for a week now (Sydney is cold of course), and it is still fresh and good to go, after 10 secs in the micro! d) Now since you are adding all that ghee, use a good quality ghee which smells fragnant! I buy high quality white butter, and make the ghee at home – as I am just not satisfied with store bought ghee! e) Make sure you have high energy and are in the mood to cook, when you begin this venture!You will need to stir, and stir and stir continuously, and it takes nearly an hour to cook! If you relax, the halwa can burn in a second! e) Motivate your spouse to help you with the stirring! Hubby and I took turns, so that we did not leave the halwa unsupervised for even a second! f) Watch the Vah Chef’s video to learn the recipe and get entertained as well!! The backyards of the village houses in South India are abundant store houses of varieties of greens. Houses in cities which are blessed with small gardens are also adorned with at least a small ‘ keerai pathi’ (Greens patch). Anything in abundance tends to lose its value. And sadly, although ‘keerai’ is used quite frequently in the day to day cooking, a keerai meal for a guest is usually looked down upon! The nutritional and therapeutic value of the various keerais which grow luxuriantly on their own is astounding. Introducing a variety of greens to the children other than their favourite 'palak paneer' dish will ensure them an all round healthy development. Amaranthus or Thandu Keerai Mashial is one of my favourite greens dish. This dish reminds me of a story which my maternal grand father had narrated a long long time ago. Grand father loved to tell stories and we loved to listen to him because he made it a very exciting, interesting and humorous experience for us. His animated style of narration, his timing and his punch lines made us sit glued in front of him for hours together except at times when we held our stomachs and rolled on the floor with uncontrollable laughter! Here goes the story about a man who hated keerai, that grandfather used to almost act out for us! Once the short tempered man lost his temper, when wife served him keerai. He ground his teeth, ranted and fumed and trashed the keerai dish spilling it all over the floor and splashed on the wall. It so happened that he licked a bit of the keerai which had also splashed over his lips. No sooner did he taste the keerai, he knew he’d thrown away a good dish. However, he needed to save his ego and so …he bellowed at his wife yet again, “SUVATRU KEERAIYE VAZHI PODU DEE VETKAMKETTAVALAE!” Meaning “SCOOP UP THE GREENS FROM THE WALL AND SERVE, YOU SHAMELESS WOMAN”. He had to cover up his own shamelessness by calling her shameless! If only we could all put away our prejudices and tried to take a wider view of (not just the dishes) all that matters, what a great experience that would be! There is another story which my grandfather had narrated about Tenali Rama, The proud King and Keerai Thandu. While the storyline is very funny, my husband thinks it’s not suitable for a food blog!! My grand children always roll on the floor laughing, when I narrate it to them! 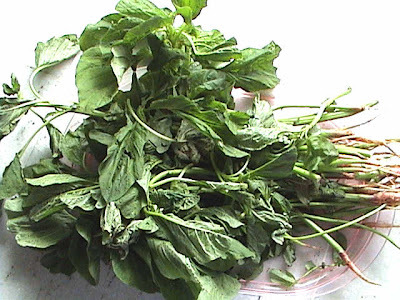 Thandu keerai ( Amaranthus) – 1 big bundle. 1. Pressure cook dal with 3 cups of water and turmeric powder to a mushy consistency and keep aside. 2. Cut off the roots, wash the keerai well and chop it. The stem can also be chopped along with the leaves provided it is tender. This is the tastiest part of the vegetable, and provides a good texture as well. If the stem is too fibrous its best to discard it. 3. Heat 1/4 cup of water (just enough to cook the greens) in a heavy bottomed pan and add asafoetida and cumin seeds. 4. Add the thoroughly washed and chopped keerai to it. 5. 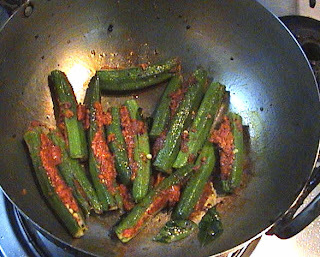 Cover and cook until the keerai and its stem become tender. 6. Lightly mash with the back of the ladle and add the cooked dal. 8. Blend well and add the pre soaked ground nuts (optional) and cook for a few more minutes. 10. Heat oil and season with mustard seeds and black gram dal. 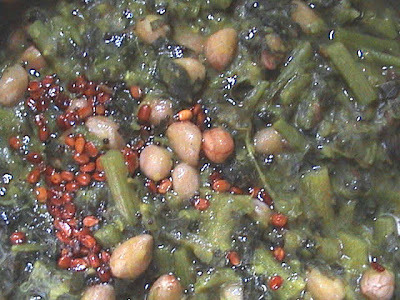 Thandu keerai mashial has a unique flavour and it is a tasty healthy dish. My children who are not all that fond of keerai, lap it up when ground nuts are added to it! This was mother’s advice. 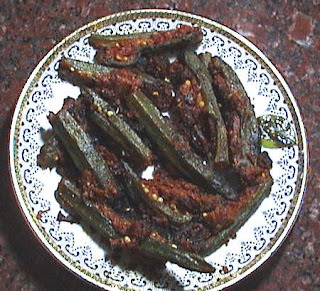 We liked vendaikai (okra or ladies finger) only if she prepared the vegetable, because our cook usually ruined it by making a slimy slush out of it. Mother prepared a nutritious sambar or a lip smacking puli (Tamarind) kuzhambu or a simple sautéed curry with vendaikai which we enjoyed with rice. Occasionally she prepared vendaikai thair pachadi too. We had not tasted the vegetable in any other form until father took us out on a North Indian tour. I must have been around 10 years old at that time! Father had already driven a thousand five hundred miles to show us around South India. Now he planned to show us the India beyond Bangalore. With the me and my two siblings tucked away comfortably in the back seat, and with mother seated beside him with my baby brother on her lap, he took to the wheels of our latest ambassador car and we zoomed on the national high way towards Aurangabad after visiting Hyderabad. We were thrilled when we tasted the bendi masala which was served with our dinner. None of us had ever seen or tasted a dish with whole vendaikais in it till then! The next day we were off to see the famous Ajanta and Ellora caves, with the hotel ‘boy’ who came along with us as a guide. He also carried our lunch in a huge tiffin carrier and lugged it along where ever we went. The serene and tranquil atmosphere of the hills was suddenly shaken by a big thud when the carrier slipped and fell from the boy’s hand. To my greatest horror and disappointment all the bendi masala had scattered on the ground along with the rest of the food. My father must have seen my disappointment in my teary eyes, and so when we returned to the hotel that night, he ordered two extra portions of the dish which had caught my fancy! In Mysore, the gun house of the royal family was converted into a restaurant called ‘The Gun House Imperial’ a long time ago. I do not remember whether they fried it or grilled it, but their bendi masala was deliciously crisp. I present my version of my favourite vendaikai masala here. 1. Heat a drop of oil and add cinnamon. 2. 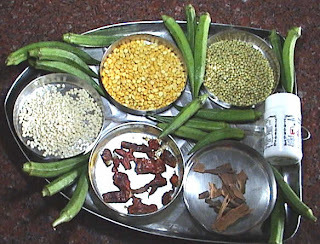 Then add the coriander seeds, Bengal gram dal and black gram dal and roast till it gives out a pleasant aroma. 4. Cool the roasted ingredients and grind them into a coarse powder. 5. 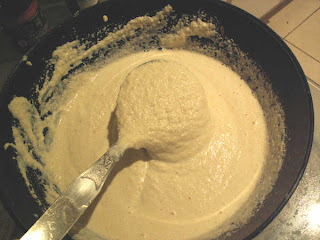 Add salt and a little water and run the mixer for two more minutes to get a thick paste. 6. Now wash and dry the vendaikai. Cut off the top and the tail portion. 7. Using a sharp knife slit the vegetables lengthwise. 8. 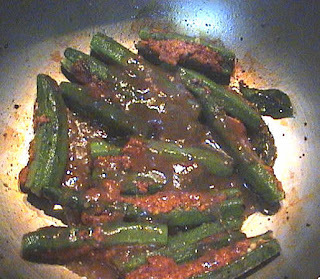 Stuff the slit vendaikais tightly with the prepared masala. 9. Heat the oil in a thick bottomed pan and add mustard seeds. 10. When it splutters arrange the stuffed vendaikais in the pan and lightly roll them one by one in the oil. 11. Add the thick tamarind extract ,mix lightly and cover with a lid. 12. Cook on slow fire turning the vegetables now and then. 13. 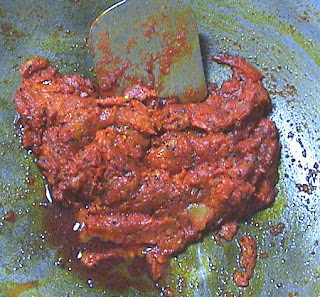 Remove the lid when the vendaikai becomes tender. 14. Continue roasting till it becomes dry. Enjoy the mouth watering vendaikai masala with chapattis or rice. 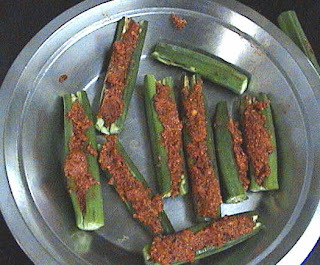 TIP: Before cutting vendaikkais, wash them well, and dry them with paper or cloth towel. Vendaikais have a slimy substance, which becomes even more slimy with water, and this often ruins the texture of the vendaikkais! The market is flooded with a great variety of colourful vegetables. But one never returns without the brown round insipid looking tuber in the shopping bag every time one goes to the green grocer. The same tuber when combined with our favourite spices turns out to be a fire brand elevating our spirits to the highest heavens. Potatoes! The darling vegetable of every connoisseur! 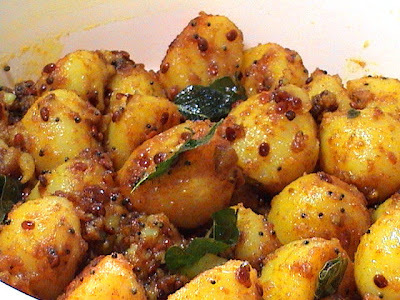 Urulaikizhangu (potato) roast tops the list of a menu plan for any special occasion. Urulaikizhangu roast is simple and easy to prepare, yet it is a delicacy which steals the hearts of young and old alike. Roast prepared with baby potatoes is a star attraction in dinner parties. My grand children like to finish off their meal with only a bowl of potato roast. Since my potatoes were slightly bigger than the usual baby potatoes, I have halved them before spicing them up. 1. Wash the baby potatoes well. Take some water in a pressure cooker. Take the potatoes in a separate vessel, and place the vessel in the pressure cooker, over the water. Avoid adding water directly along with the potatoes. Cook for one whistle on High Flame, and one on Medium Flame, and then switch off the cooker. 2. Thoroughly cool and then peel the potatoes, one by one, taking care not to mash them up. 3. Leave it in the fridge for half an hour until they cool down and become a bit firm. 5. When it splutters add the black gram dal. 6. When the dal turns golden in colour, reduce the flame. 7. 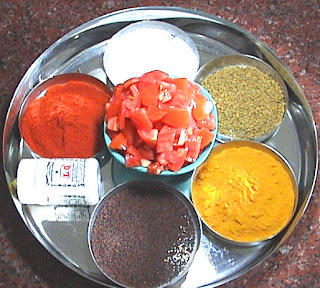 Add curry leaves, turmeric powder, sambar powder and the salt. 8. Now drop in the cold potatoes and gently turn them around with a spatula, until they are entirely coated with the oil and spices. 9. Increase flame and stir for a few more minutes. 10. Now again decrease flame and let the potatoes get roasted slowly. 11. Roast until they acquire the desired crispness (about 40 minutes). Stir now and then for even roasting and to prevent the potatoes from getting burnt. Relish the urulaikizhangu roast while still hot and sizzling. Crispy spicy crunchy on the outside and soft on the inside - it is sure to take you to soaring heights! These can be made with regular potatoes as well, by chopping them into small pieces. They need not even be pressure cooked, and you can simply begin with Step 4. This takes longer to get cooked and roasted, but tastes wonderful. Note from Dibs: Almost every cuisine has some form of roasted potato or the other, and I have tasted many of them! An aloo bhajja, a hash brown, or the urulaikizhangu roast, are all distinctly different – not just because of the spices – but the manner in which they are cooked! There are potato roasts, and then there are the ultimate potato roasts! I have made this recipe several times, and while every time the results are good, it takes patience with cooking on a low flame, and practice with making sure all parts of the potato get sufficient time to sit at the bottom of the vessel, to get that absolutely ultimate - perfect even golden roast - wonderfully crispy outside, soft and well cooked inside! And then …if I’m feeling very lazy, I just pop the potatos in the oven at step 10. This tastes great as well – but then it is not just quite the same! My friend’s daughter had a craving for Tomato Tokku. She remembered the tokku which she had tasted long back at her guardian’s place when she was working away from her home. It is a custom to fulfill all the cravings of an expectant mother so that she delivers a healthy happy baby. Tomato tokku is new to me, but any way I decided to give it a try. My friend’s daughter relished the tokku very much and here I am happy to share my recipe with all of you. 1. Heat til oil and add the asafoetida and mustard seeds. 2. When the seeds splutter, add tomato pieces, turmeric powder, salt and sugar. 3. Stir well and cook covered in low flame. 4. When the tomato becomes a pulp, add chilly powder, and cook without the lid. 5. Keep stirring now and then. Cook until the oil separates out from the pulp. This takes about 25 - 30 minutes. 6. 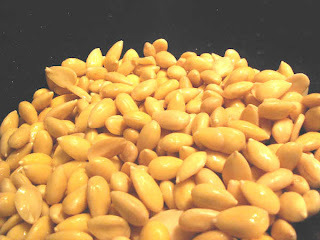 Now, dry roast fenugreek seeds on a tava, and grind or pound into a fine powder. 7. Mix the fenugreek powder into the tokku. This step fills the kitchen with a lovely aroma! 8. Tokku is now ready. Store in a clean dry glass bottle. 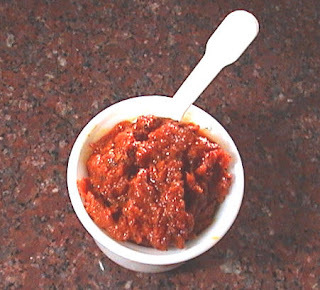 Properly cooked tokku will stay for many days at room temperature – just like any other Indian pickle. If the oil is insufficient, or any moisture remains, the tokku will get spoiled. If you are unsure about your tokku, you can safely store it in the refrigerator, and use within a week. This simple and zingy tokku livens up any meal. You can take it with rice and ghee, or along with chapattis, dosai, idli, or along with curd rice.